As in mechanical threads, not the spider or web threads: a helical projection of uniform section on the internal or external surface of cylinder or cone. Also, the operation of cutting a screw thread. A British system of threads with 47.5° included angle with rounded roots and crest. 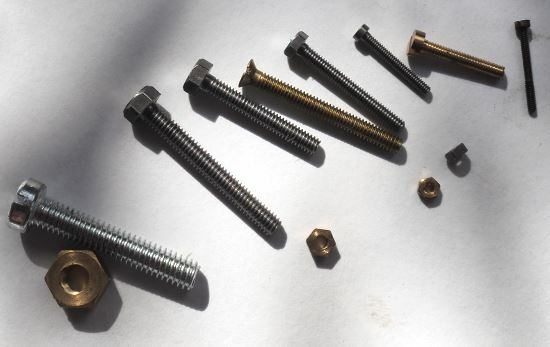 A selection of BA nuts and bolts in sizes from 2BA to 12BA and in steel and brass. A specialist thread form based upon the Whitworth thread and consisting of 26 threads per inch whatever the thread diameter. A family of standard screw thread types that has been adopted internationally for interconnecting and sealing pipe ends. BSPT – British Standard Taper Pipe Thread – the taper is 1:16 and so for each 16 units of distance along the axis of the thread, the diameter increases by 1 unit of measurement. The form follows the British Standard Whitworth standard. Developed by Sir Joseph Whitworth in 1841. A screw thread with one vertical and one inclined flank. The most commonly used type of general-purpose screw thread, one of the first international standards agreed when the International Organization for Standardization was set up in 1947. A screw thread that is screwed in by rotating clockwise. Most threads are right handed. 1739 Henry Hindley designed and constructed a screw-cutting lathe featuring a plate guided tool and power supplied by a hand-cranked series of gears. Used in telephones around 1900 AD. German electrical engineering company that later became part of Siemens AG. Both flanks of the thread profile are inclined at the same angle. A hand tool that can be locked onto the square post on the tap and used to apply a torque to cut an internal thread. When using a tap wrench it is usual to turn the tap 180° clockwise and then back off in the opposite direction before cutting the next 180°. This allows the tap to clear the swarf. The angle formed by the two sides of the thread (or their projections) with each other. The thread angle is quite an important factor that should be taken into account when looking at the application of the thread. A line running lengthwise through the centre of the screw. The axis should run parallel to the crest and root. Sometimes it is difficult to machine accurately over a long length of thread. The top surface joining the two sides of a thread. The distance between the crest and the root of a thread. Important to look at the thread depth, pitch and angle when considering certain types of materials and applications. This is the radial distance between the minor and major diameters of the thread. The length of the portion of the fastener with threads. A micrometer in which the spindle is ground to a point having a conical angle of 60 degrees. The anvil, instead of being flat. has a 60 degree V-Shaped groove which fits the thread. The distance from a point on one screw thread to a corresponding point on the next thread. The diameter of a screw thread measured from the thread pitch line on one side to the thread pitch line on the opposite side. The bottom surface joining the sides of two adjacent threads. On external threads the roots are usually rounded so that fatigue performance is improved. The number of threads in a linear inch along the length of a threaded component. Unified Coarse Thread Series. Standardised in 1918. Derived from British Standard Whitworth. 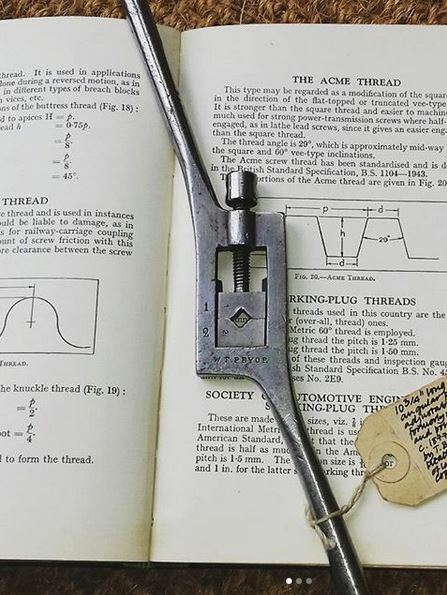 Unified Fine Thread, Standardised in 1918, Angle of Thread 60°. 500 BC The philosopher Archytas first invented the screw. They were made out of wood and used for wine and olive oil presses.